Jameis Winston threw for 312 yards and two touchdowns to help the Tampa Bay Buccaneers snap a four-game losing streak with a 27-9 victory over the San Francisco 49ers on Sunday. TAMPA, Fla. (AP) — James Winston is determined to make the most of his latest opportunity to prove he’s Tampa Bay‘s long-term solution at quarterback. 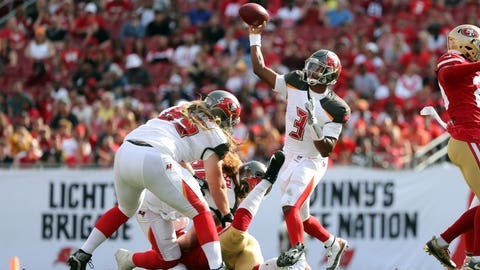 The fourth-year pro sparkled in his first start in a month, throwing for 312 yards and two touchdowns in the Buccaneers‘ 27-9 victory over the San Francisco 49ers on Sunday.